International students must undertake a full-time study load as per their student visa conditions. A full-time study load is normally a minimum of 20 hours per week during study period. You are expected to attend all scheduled classes or workshops. If you do not attend classes you may risk failure. All students at Danford College are subject to rules and policies governing satisfactory academic progress. If you do not make satisfactory academic progress, you may be reported to the Department of Immigration, which may lead to cancellation of your visa. This is defined as failing more than 50% of units in any two consecutive study periods (one study period equals one term). A failure in more than 50% of units in one study period will trigger a review of academic progress by Danford College and an intervention strategy. It is a requirement of your student visa that you have sufficient funds to support yourself and to pay for your studies in Australia. If you do not pay your tuition fees on time the college may cancel your enrolment and notify the Department of Immigration for further action. After arriving in Australia you must advise Danford College of your new residential address and telephone number, and of any subsequent changes to your residential address. It is your responsibility and in your own interests to ensure that your address details are always up-to-date at Danford College. It is also a vital legal requirement of the ESOS Act and your visa conditions by the Department of Immigration. Should you breach a student visa condition relating to attendance or academic performance, Danford College may send a notice of breach to this address. To meet our obligations under the ESOS Act and the National Code 2018, Danford College must collect information on this form and during your enrolment. This ensures your compliance with the conditions of your visa and your obligations under Australian immigration laws. Information collected about you on this form and during your enrolment can be provided, in certain circumstances, to the Australian Government and designated authorities and, if relevant, the Tuition Assurance Scheme and the ESOS Assurance Fund Manager. The College seeks to continuously provide a high quality education and training environment that is safe, fair and free from discrimination, in which all are encouraged to strive for excellence and fulfil their potential. The resolution process will focus on a rapid re-establishment of good educational working relationships and positive outcomes. Complaints and Appeals can relate to academic and non-academic matters and is available to all staff and students of Danford College. There is no charge for Danford College complaints and appeal process or if the student seek an external appeal through the Overseas Student Ombudsman www.ombudsman.gov.au. 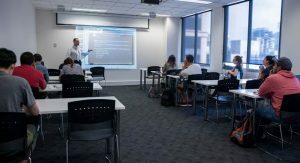 Danford College complaints and appeals policy does not limit the rights of individuals to take action under Australia’s Consumer Protection Laws.